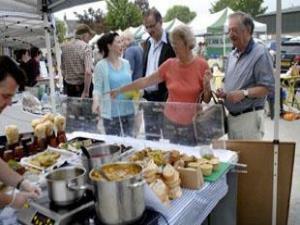 The Vale of Glamorgan Farmers market at Penarth is normally held on the fourth Saturday of the month at Westbourne School, 4 Hickman Road, Penarth CF64 2EZ. All products sold have been grown, reared, caught, brewed, pickled, baked, smoked or processed by the stall holder, made up of farmers, growers and producers who travel from within a defined local area to sell their produce in person. Produce includes meat and poultry, vegetarian and specialists products, eggs, cheese and dairy, bread and baking, fish, honey, chutneys and preserves, fruit and vegetables, drinks and plants and herbs. M4 Junction 33, A4232, A4160.